It’s Guitar Hero 4, I don’t care what anyone says. Yes that’s right, it’s wrapped in electric tape. Basically this turns the kick pedal into an air pressure diaphragm. You can now “kick” the bass drums by blowing into a tube. Want to do this mod for a friend in need? Check out the easy how-to instructions after the break. 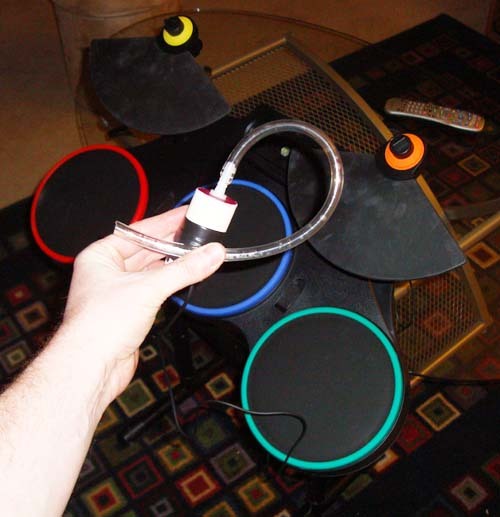 Please note: this is for the Guitar Hero 4 (ahem WORLD TOUR) drum kit, not Rock Band. A Rock Band suggestion is at the end. For yet another video of me acting like a moron while demonstrating my projects, click here. OK let’s build this sucker. Rip apart a GH4 kicker pedal and you’ll find this metal disc in the base of it. 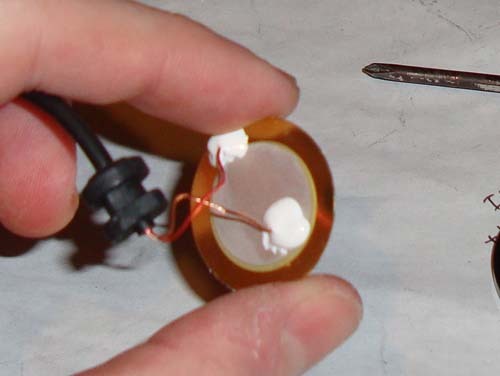 This is a piezoelectric sensor which creates a small voltage when impacted. What we’re going to do is make a small assembly that is sensitive to air pressure instead of… well… pressure pressure. 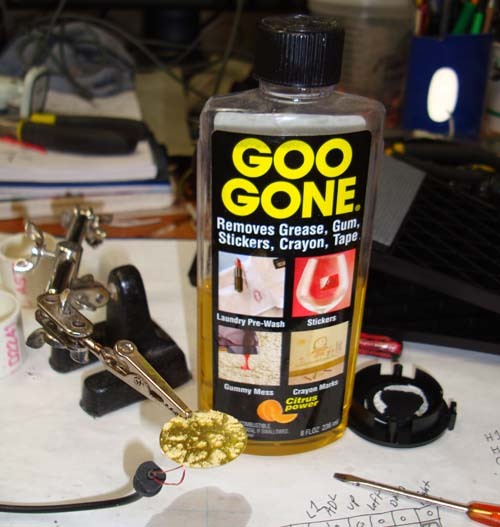 Ever buy this Goo Gone stuff? Well you should – it works great. 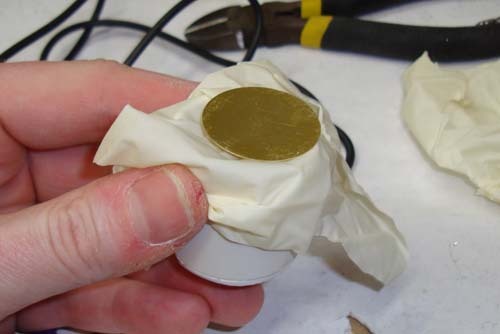 Use some to get the glue off the top of the sensor. OK next cut up some PVC pipe. You’ll need 2 pieces, each about 1.5″ long. 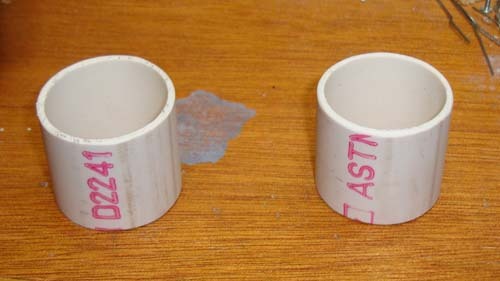 The inner diameter needs to be wider than the sensor, in this case, about 1.25″. This assembly will be in 2 halves. Next, glue some pieces of plastic onto the end of each piece of PVC. These are the end caps. OK now run down to the hardware store and get a rubber hosing barb. 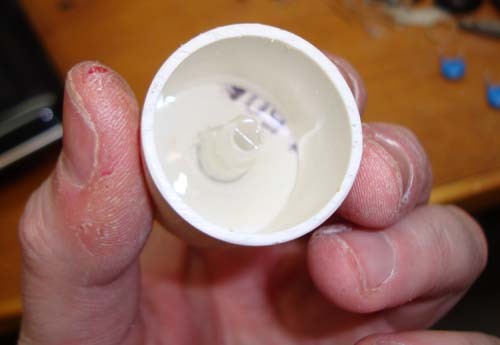 Drill a hole into one of the end caps and glue the barb in but good. I’d suggest liberal amount of hot glue inside the pipe to make sure it’s well sealed. Aforementioned liberal use of hot glue – hey it’s cheap. 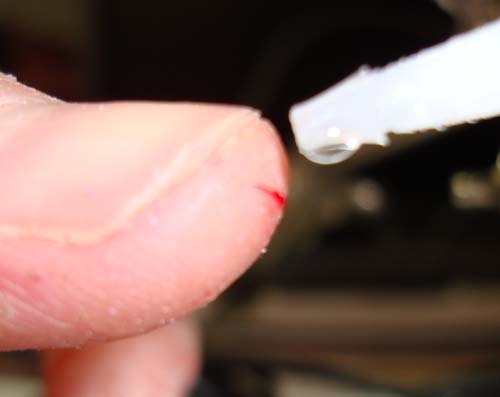 Fun tip – if you cut yourself – perhaps while scraping off glue with a knife too close to your fingers – and the blood is getting all over your project, simply seal the wound with a bit of superglue. It works quite well, thanks for the tip Jesse! OK now for the other half. Cut away the edge of the end cap so the cable can fit though. 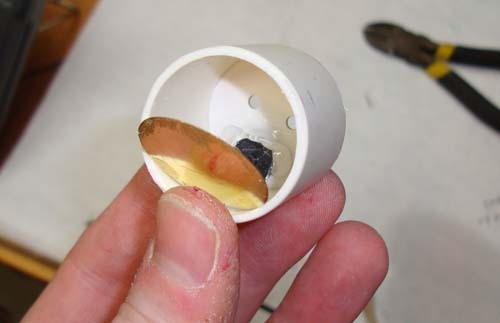 It may also be useful to drill some air holes so that this side of the assembly isn’t a vacuum. Put the sensor and end cap on the other piece of PVC. The PVC should be short enough that you can still grasp and work with the sensor. 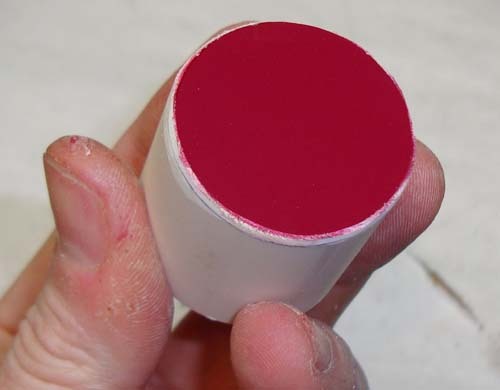 Now find a rubber glove or any similar type of material. 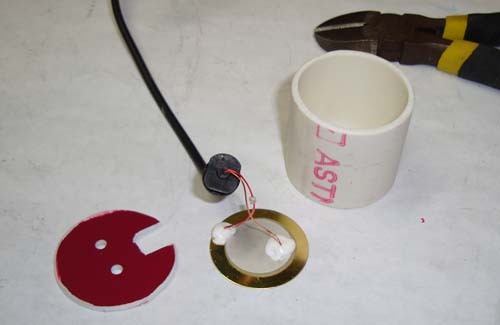 Cut a small slit in the middle of it, then feed the sensor and wires through. 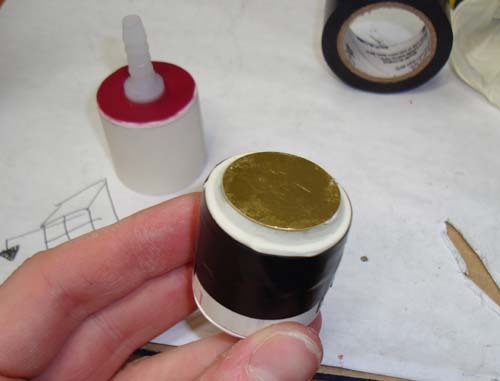 Then glue the sensor over the slit onto the rubber to seal it airtight (seal up the slit). Next stretch the rubbery material tightly around the PVC pipe and tape it down – you will note this is very much like making a drum in kindergarten. Be sure the sensor stays centered on the pipe. Now tape the two PVC pipes together. I used electric tape for an airtight seal. 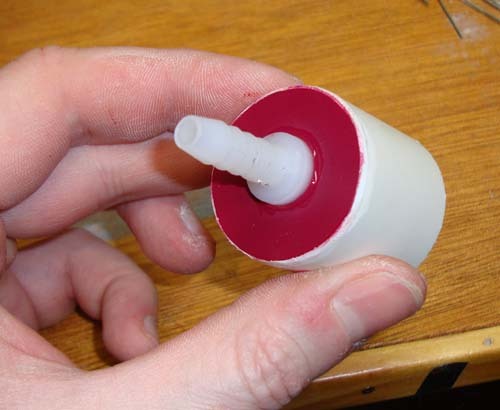 Try blowing on the barb – you should feel the diaphragm “click”. This will simulate the foot pedal being kicked and voila – you have done it! 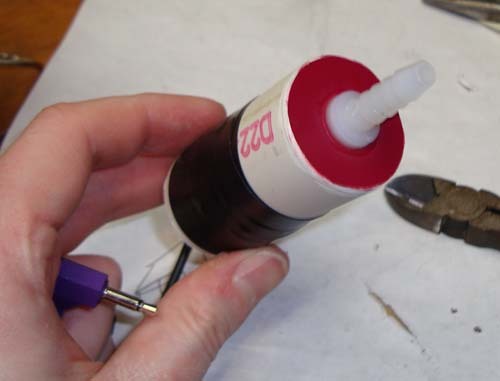 Simply attach a tube of desired length to the barb and you are ready to rock. Note: Use a tube with around 1/4″ inner diameter… if it is too small/thin it is difficult to get enough air pressure to trigger the switch. The Rock Band drum pedal is somewhat simpler… it’s just a magnetic switch. To build something like this for it, do an online search for “pressure switches”, wire one to the pedal, attach a tube and go for it! Ben Heck is the next mother Teresa. You should attach the tube to a headset, that way you don’t have to clamp it with your teeth to keep it from falling down. Ben you know this paves way for the Jazz Band expansions right… Sax and Trumpet molds? Brass Band Hero anyone? Great work and kudos as usual for putting a new spin on an old interface to make it user friendly for everyone. Pingback: Ben Heck fashions breath-controlled kick pedal for Guitar Hero | Gadgetorium! Sweet! I’ve always been a bit bummed that I could never be the drummer because of my spinal cord injury. Can’t wait to attempt to build this. Pingback: GoNintendo » Blog Archive » Air Pressure Kick Pedal for Guitar Hero World Tour- What are you waiting for? It amazes me there isn’t a company that does this sort of stuff on a mass market level. With a fracking war going on, it would seem the already existent market for handicap accessible accessories would be noticeably increased. I know Ben is starting to market this sort of thing with his one handed controller, but with the insane popularity of games like this, why is he the only one? The country is going down the crapper, and big companies are still too stupid to realize the market for things like this? Bravo to you Ben. I hope someday you make a million dollars for being the only one intelligent enough to think of this stuff. I had a look inside, and found a simple 2 pin connector on a PCB, that goes to that specific MIDI port. I tried to swap the connectors around, but no change. BTW, you looked like you were having fun in that video! Can you elaborate on the type of pressure switch when doing a search for the Rock Band Drum mod? There are a lot of different types of pressure switches that pop up when just googling ‘pressure switches’. Radu, you could try that wireless USB adapter if you’ve got the 360 version. As for pressure switches, they don’t have to be very big or sensitive. For [another project that isn’t on the site yet] I used some from a Michigan company called World Magnetics. Mark… I just super-glued a new cut. What’s liquid skin? Is that like liquid metal? Pingback: Ben Heck fashions breath-controlled kick pedal for Guitar Hero | Are you reading? Pingback: RB :: Bringing the lulz since 2002. Great blog. Do you know of any relevant marketing forums or discussion groups? Great mod! Used a lot of ideas from it for my el-cheapo puff switch for testing accessibility software (see website). Thanks! Be careful with that superglue. sealing a wound with it may seem like a good idea but putting foreign material especially if it contains formaldehyde in an open wound can lead to more scar tissue. Any ideas on using this concept for a set of roland electronic drums?? I came up with a similar concept (thought I was being original – apparently not hah..but this is great stuff). I have no visuals as I’ve not found anyone yet who can actually help me put this stuff together — but have a look at the blog – http://www.musingamused.blogspot.com and if anyone has any ideas/suggestions, feel free to contact me. DRUMMERS (and wanna be drummers) UNITE!!!! !